I have just returned from a trip to San Jose, California to visit my father. It was a journey through two lifetimes of memories, mine and my dad’s. Now that I’m home, I’m still trying to believe that my long-awaited trip has come and gone. My father, Ed Fagalde, is 89. I just turned 60. We are both widowed. We both order senior meals now, and we had a fun conversation comparing our prescriptions. We are lucky that Dad is still able to live on his own and doesn’t seem nearly as old as he is. Wherever we go, memories of our spouses go with us. I can see Mom in her chair by the window, hear Fred laughing at a joke. Dad is a storyteller. Boy, does he like to talk about the good old days. We both grew up in San Jose. Dad grew up on the Dorrance Ranch, where his father was foreman. They raised prunes, cherries and other crops. Driving down Curtner Avenue between Monterey Highway and Meridian Road, he noted that we were in the middle of the ranch, which extended for hundreds of acres. He pointed to trees that were there long before the area became a suburban housing tract. Everyplace we went, I had my own memories to match my father’s. “We had a big well here,” he said as we crossed the intersection near St. Christopher’s Church. I went to church here the first couple years Fred and I were married. He wired that building over there when he worked for Sure Electric. I interviewed the people who worked there for the San Jose Sun. We drove through Saratoga, where I was editor of the Saratoga News, and Los Gatos, where I wrote for the Weekly-Times, had cheeseburgers and fries at a Burger Pit just like the one we went to almost every weekend when I was a kid, then headed east to Almaden, which brought back memories of my days writing for the South Valley Times. Dad’s memories went back much farther. In the late 1800s and early 1900s, San Jose had two working quicksilver (mercury) mines, the Almaden and Guadalupe mines. Dad’s grandfather and father worked at the Guadalupe mine, and his mother taught at the school there. Both mines are long closed now. In fact, the Guadalupe mine site is a landfill site now. As the road narrowed, we drove through miles of oak trees along Los Alamitos Creek, past the houses of the wealthy and the eccentric, past a dam and a county park with trails leading to the mining sites. Dad recalled riding that steep road on bicycles with his cousin Irene. Going up was tough, but going down was really exciting. He pointed to where there used to be a dance hall, a picnic area, a swimming pool. He told how his grandfather, who was more comfortable with horses than cars, took driving lessons from a local guy in exchange for breaking two horses. These days, the road leads to a big white building that has been a dance hall, a bar, a theater, and a restaurant. I did a story there, too, can’t remember which paper it was for. Now it’s a museum. The sign said the museum was closed, but there were cars in the parking lot, and Dad insisted we knock on the door. Surely they’d just send us away, I thought, but no. 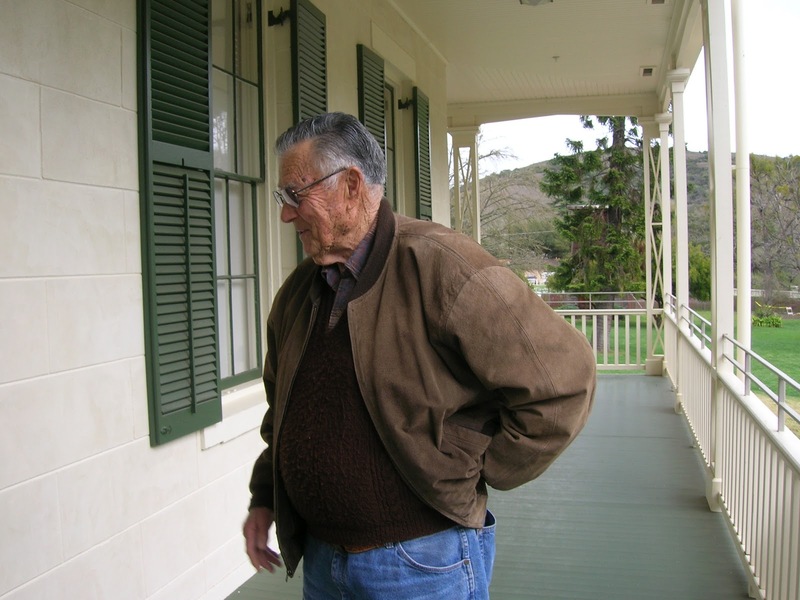 When Dad shared some of his history, Ranger Mary Berger let us in for a private tour of rooms decorated to look like 1850s parlors and other rooms full of information about the old days of Almaden. She described a busy schedule of activities we might enjoy. Meanwhile, Dad told her a few things she didn’t know about Almaden. It was the highlight of a week full of memories. We visited my brother at his hilltop estate near Yosemite, talking, eating and watching basketball on TV as the rain cascaded down outside. I had lunch at an ultra-modern restaurant in Newark with my stepdaughter and dinner with my aunt at La Paloma in Santa Clara. All too soon, it was time to say goodbye, warmed by memories made new by sharing them.